In 1557, the Portuguese first gained the right for permanent settlement on the peninsula of Macau, for a rent of 500 taels of silver a year to the emperor of China. After a long and eventful history as a European colony, involving indepence, wars, assassinations, slave trade – seriously, check it out, it’s pretty interesting – it reverted to Chinese administration as a Special Administrative Region in 1999. 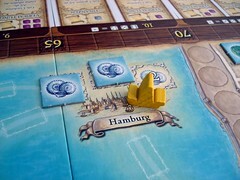 And then, in 2009, Ravensburger goes and has their magical game-making elfs produce lots of wooden cubes and packs them into a game called Macao, which takes you straight back to the 17th century, the golden age of the colony of Macao. Macao - the city of opportunities? As a freshly arrived adventurer from the portuguese homeland, you will try to make your way in the colony, gaining money and political influence. Those things, of course, are only tools to you on your way to your real goal: VICTORY POINTS! And to get those, you will have to manage multiple careers, as merchant, politico and real estate owner, and also demonstrate a bit of planning ahead and an uncanny skill at disaster management. Why disaster management? Because luck has a strong influence on Macao, but will usually even out between the players before the game is over. You will start the game with 3 little wooden cubes on your 7-sided compass, one card on your player panel and 5 coins of gold. Looking at the compass first, it shows one facet with an arrow and 6 facets with a dice, one each from one to six. Around this compass, you place the little wooden cubes – action cubes, as the game calls them – in six different colors, and the lower the compass number they are next to, the sooner you get to use them. More on that in just a second. The cards come in 3 flavors: office cards, person cards and building cards. Every card has a price, payable in wooden cubes of the right color, and an ability that is explained on the card. While person and building cards are drawn randomly – your initial card will be one of those – office cards are put around the game board face up. This allows you a small glimpse in the future and also serves as a round counter. There is 24 office cards, every round two of them are used and when those cards are over after 12 rounds, so is the game. 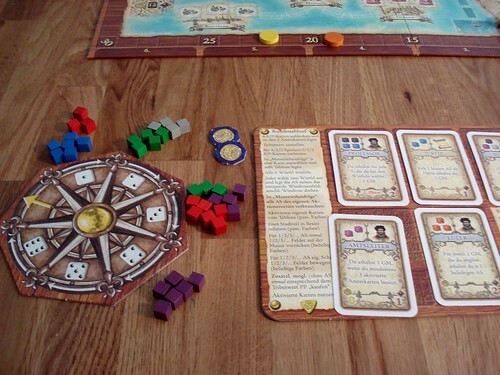 Additionally, every player starts with a shipmeeple (I know it sounds silly, but “Meeple” is in the name of the blog, so I’m contractually bound to call everything a meeple where the term is remotely applicable) in the harbor of Macao and a wooden disc (not even I can call those meeple) on the beginning of the city wall. The game goes in 12 rounds. Each round starts with taking the 2 office cards from the turn counter and add 4 random cards from the stack. All the cards have a golden and a red number in the bottom corners. Those numbers are added up for this rounds price of victory points. The price can be between 0 and 12, and so can be the amount of victory points you get for that price. The price can vary widely from round to round, since it’s completely random, and you can get extreme rates like “10 points for 3 gold”. Then, every player chooses one card to put on his player panel. This, like everything else in the game, is done in the order of disks on the Wall: the first disc on the Wall goes first, if there is a stack of discs in one place, the order is from top to bottom. The card you just got is, for now, worth -3 points and nothing else, until you activate it. Next, one player rolls all six colored dice. If your game is like ours and comes with an additional yellow dice, just ignore that one and don’t spend half an hour rereading the manual over and over. It’s not mentioned anywhere in there, so we’ll assume a packaging error. Now the truly agonizing part of the game starts. Every player choses two of the colored dice – he doesn’t remove them, all players can chose the same dice – and takes that many cubes of that color and puts them next to that number on his compass. Then he turns the compass clockwise, so that the arrow points to the cubes that were next to the one before. This actually sounds more complicated than it is. When you chose the a dice showing the one, you receive one cube and use it on this round (it will be next to the arrow after the turning). If you chose a dice showing the six, you receive six cubes of that color, but you can only use them 5 rounds from now. The more you plan in the future, the more cubes you get. If you’re tempted now to skip a few rounds and only get sixes: every round that you have no cubes at all, you lose 3 points. You think I shouldn’t call this simple and straightforward procedure “agonizing”? Well, think about this: there is cards that require you to have cubes of 4 different colors on the same turn. You will want to activate your cards as quick as you can, because your panel only holds 5 cards, and every time you have to discard one to make space for a new one, you lose three points. And you will also want to pay for other stuff. Choosing the dice is not often an easy choice. Activate a card: pay the price for one of the cards on your panel and put it from the panel to the table in front of you. You can use the card on the same turn, and you can activate as many as you can afford. Take over a district of the city: we haven’t really talked about the city yet. On every district of the city, there is one kind of trade goods – tea, spices, paper and so on. When you take over a district by paying the cubes printed on it, you take those goods and put them in front of you. They are now loaded on your ship. Even if the ship is in Europe already. You also put an ownership marker on the district. There is 6 special districts that give you a joker instead of goods. This joker can become 3 gold coins or one cube of any color whenever you need it. You can only take over one district per round. Move ahead on the wall: one cube of any color gets you one step on the wall, walking faster is more expensive. If there is a disc on the field you are entering already, your disc goes on top, so you are before that player in the turn order now. Move your ship: one cube of any color also buys you one step on the way to Europe, you can travel as far as you can afford. The goods you are taking out of Macao fetch a high price on the European market, but every European city only trades in one kind of good. The first to arrive there with the right goods will earn 5 victory points, the second one 3 and the last one 2 points. Buy victory points: once per round, you can pay gold coins for victory points, according to this rounds rates. Use cards: Most cards you can use once per round after you activated them, for no additional costs. You can use those cards whenever you want during your turn, and they have effects that vary widely: get cube of a specific color, move ahead on the wall, move your ship and many others. You do this until you run out of cubes, or until you decide to pass to the next player. Cubes that you did not use are lost, you can not take them to the next round. This is repeated 11 more times until the game is over, only that after round 6, some dice are turned to “one”, because there is not enough rounds left to use the number they were showing. After the first 2 rounds, the game will likely appear very quick to you and you won’t see how it can take 90 minutes, but with every round you gain more options, so the rounds tend to get longer towards the end. There is two more kinds of effects that you can get from cards, other than the use effect described above. Some cards will have an effect whenever something specific happens. For example: “Whenever you receive at least one gold coin in a round, take an additional gold coin”. Wording on these cards can be tricky, there is a big difference between “whenever you use a Military card” and “whenever you use at least one Military card on your turn”, and the first few times you play, you will have to watch closely when and how often those effects kick in. The third kind of card is “at the end of the game” cards. Those give you additional points based, on other cards. You might get more points for every person card that you have, or for every district you own, or just 7 points unconditionally. When the game ends, everyone loses three points for every card they didn’t activate, wins points according to their game’s end cards and the player with the most connected districts in Macao earns some additional points for those. After the first two or three rounds, you will most likely realize why I was calling the game agonizing. For every card you pick and every dice you chose, you will be mulling over the alternatives. Do you get the card that has synergies with the ones you already have, or do you take one that you know you can afford. Do you take three green cubes just to make sure you have the one that you need on that turn, or do you take six blues instead and hope for a low green roll on the next turn? Don’t get me wrong here, agonizing does not mean that it is not fun. All the decisions you make are meaningful, and it’s very satisfying to come up with a solution to the problems. But the resource allocation is completely unpredictable, at least until the last few rounds, when more and more dice are turned to one. You will regret many of your decisions later, but in most games, so will the other players. It’s close to impossible to plan a long term strategy in advance, in parts because of the dice, and in parts because of the cards drawn. So the winner will be the player that makes the most out of those random events, rolls with the punches, so to speak. Of course, as in any game with so many things being random, there will be days when even the best disaster recovery doesn’t help you. The dice just keep kicking when you are down already, while your opponent gets everything he needs, and on the right turn to boot. The amount of luck needed to win Macao is something we debated for some time. In general, you don’t need to be especially lucky to win. But being especially unlucky is sure to make you lose. If you prefer your games without any randomness, as a pure contest of skill, you should take this as a warning. Also, be aware that the theme on Macao is thinner than the paper you ship to Amsterdam. The action cubes are just abstract quantities, which kind of goods you get is irrelevant, as long as you deliver them to the right European port, and you can be sure that you will forget the name of the cards you were playing. You know, the one that gives you a gold coin every time you activate a person. The planning ahead mechanism with the compass is innovative and very well implemented. Having to decide between short term goals and long term profit, with the risk of losing points if you don’t get your cards activated looming ahead is fun, maybe surprisingly so. And the groans of your opponents while they try to make the same decisions will sound like music to your ears, if you like that sort of thing. Macao plays well in two, three and four people, with little changing about the feeling of the game because player interaction is pretty low anyway. The one change you will feel is the importance of the wall, almost irrelevant in two players, that is fiercely being fought over in four. Also, the game in four players can take quite a bit longer than the 90 minutes that the package advertises, and there may be some downtime while some players still bemoan their fate. 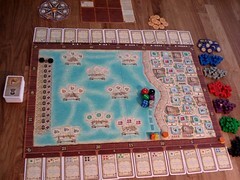 If you are looking for a game that makes you experience the life of a merchant in the Age of Discovery, then Macao is most likely not for you. If, on the other hand, you are looking for game of planning with some luck mixed in and don’t mind that it’s rather abstract, then do go give it a try .